Moresnet or Neutral Moresnet (Esperanto: Neŭtra Moresneto) was a very small territory that existed from 1816 to 1919. It had a size of 3.5 km². It existed because its neighbours could not agree on who should own it, so they decided to make it a neutral territory where both neighbours would both have power. It was 7 km Southwest of Aix-la-Chapelle (Germany), and south of the points were the borders of Germany, Belgium and the Netherlands come together on the Vaalserberg. At the Congress of Vienna in 1815 many borders and countries changed. One of the borders was the one between the new United Kingdom of the Netherlands and Prussia. For the most part Prussia and the Netherlands agreed on the border, because it was mostly the same as the old border. Around Moresnet there was a problem. Between the villages of Moresnet and Neu-Moresnet was the zinc mine of Vieille Montagne (in French) / Altenberg (in German). Both countries wanted to have this mine. 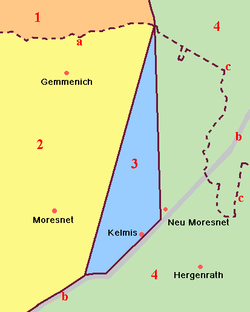 In 1816 it was decided that the village of Moresnet itself would become part of the Netherlands, Neu-Moresnet would become part of Prussia and the mine and the village of Kelmis around it would become neutral territory where both countries shared the power. Neutral Moresnet was shaped more or less like a triangle. The southern border was the road between Aix-la-Chapelle and Liège. The mine was just to the north of this road. The most northerly point of the country was the Vaalserberg. When Belgium became independent from the Netherlands in 1830, the land on the Dutch side became Belgian. So from 1830 Belgium and Prussia were in power in Moresnet. At first Moresnet was governed by two royal commissioners, one from each neighbour. Later Moresnet got its own rulers: a mayor and a council of ten members were installed. The mayor was the Head of State, he was appointed by the council. Most people in Moresnet worked in the zinc mine. Many people from the neighbouring countries also worked in the zinc mine. Because Moresnet was neutral, there were very low taxes and there were no import-tariffs (like in Andorra now). The people from Moresnet were allowed to choose in which army they wanted to serve, but they were not allowed to have their own army. The mine was exhausted by 1885, so people from Moresnet had to find a new way to find money. Some wanted to start a casino, or issue their own stamps. Dr. Wilhelm Molly, wanted to change Moresnet into a country where everyone would speak Esperanto. He wanted to name the country Amikejo ("place of friendship"). None of these plans succeeded. Belgium and Prussia (which became a part of Germany in 1871) both wanted to take over the territory. In 1914, in the First World War, Germany invaded Belgium and occupied Moresnet. In 1915 they officially annexed it, so Neutral Moresnet did not exist any more. In 1919, after the war, in the Treaty of Versailles it was decided that Moresnet would become part of Belgium. From 1940 to 1944, during World War II, Moresnet was occupied by Germany again, but since 1944 it has been part of Belgium again. This page was last changed on 2 September 2018, at 04:14.